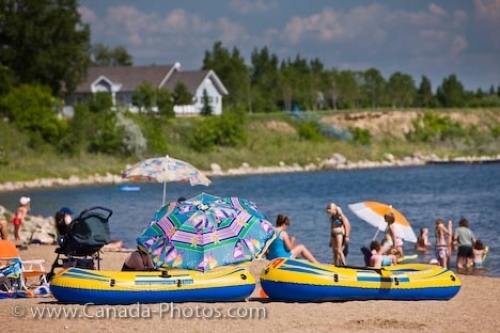 Vacationers who come to the beach at Last Mountain Lake in Rowan's Ravine Provincial Park in Saskatchewan, Canada scatter their colorful umbrellas, inflatable boats, chairs and floating devices. The sandy beach provides the ideal location to set up camp while spending the day tanning, swimming, fishing or partaking in summer fun beach activities. There are campsites located along the lakeshore making it a short jaunt during the day to the beach. Last Mountain Lake is approximately 48 kilometers from the City of Regina making it easy to spend the day here. Holidaymakers on the shores of Last Mountain Lake, Rowan's Ravine Provincial Park, Qu'Appelle Valley, Saskatchewan, Canada. Picture of vacationers enjoying the sun and the beach at Last Mountain Lake in Rowan's Ravine Provincial Park in Saskatchewan.